Although I started cooking again, here is another installment of my wife’s Indian-style dishes made while I was out of commission. 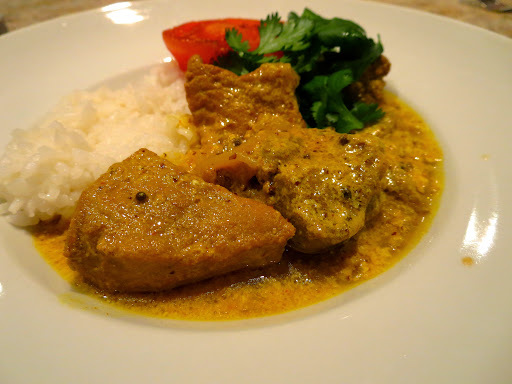 This one is a bit spicier than her usual but we liked it very much. We garnished it with sautéed half tomato (skinned and seasoned with salt and pepper) and fresh young cilantro which we are growing on the window sill. She made a few of her own modification; such as the addition of dry roasted mustard seeds and instead of using coconut milk as suggested in the original recipe, she substituted yogurt. This is not because we do not have an easy access to coconut milk but we like the taste of yogurt in this dish. Coconut milk, at least to our taste, adds a sweetness and distinctive “coconut” flavor (I am sure that must be the whole purpose of using coconuts milk). Besides, yogurt is a bit healthier (we hope). The addition of cilantro leaves (not in the original recipe) really added to the flavor dimensions. My wife added a bit more yogurt to adjust the heat just before serving. Put the mustard seeds into a dry frying pan and roast until they turn a slight grey color and start popping. Remove from heat a set aside (#2 in the picture above). Mix the mustard, cumin, turmeric, pepper, salt, and sushi vinegar together in a little dish and set aside (#2). Put the oil in a pan and sauté the onions until they are translucent (#1) and add the garlic (#2) and continue for a few more minutes. Then add the mustard mixture (#2) letting the spices bloom in the hot pan. (they will start to stick to the bottom but don’t panic). Then add the mustard seeds. Turn down the heat and whisk in the yogurt taking up any of the spices that have stuck to the bottom of the pan. 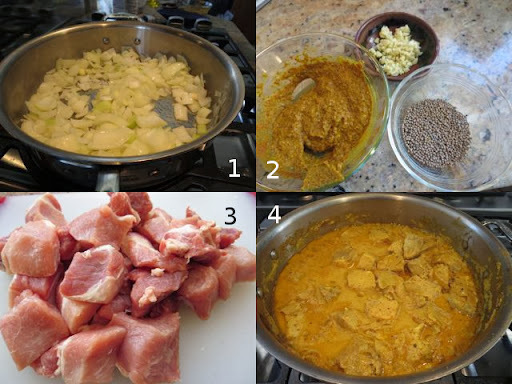 Once everything is incorporated add the meat (#3) and simmer for about 70 minutes or until the meat is fork tender (#4, we do not brown the meat since it does not add much in this type of curry dish). 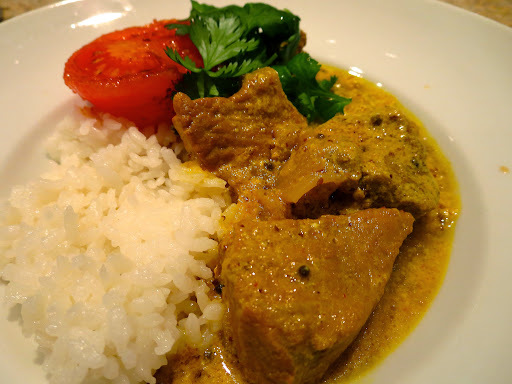 This appears to be one of my husband’s favorite curries. He asks for it frequently. I thought it would bring him some comfort while his hand healed. This is a nicely assertive curry. The processed mustard fortified with the additional mustard seed and vinegar provides a pleasant contrast to cut the richness of the pork.